New Genuine Aramith Red Circle Cue Ball 6oz 2.25" + Black Ball Carrying Pouch! 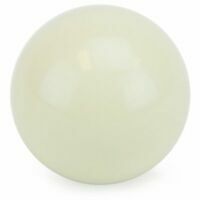 NEW # 8 Billiard Pool Ball Replacement EIGHT BALL Standard Regular Size 2 1/4 "
This is the perfect cue ball for a coin operated table. This is not the first time i have bought from this company and am always satisfied. PLUS I ordered 2 balls on Tuesday morning and they were in my mailbox Thursday morning!! That's Illinois to Texas and free shipping. Our APA league was using old, dry, and lifeless cue balls. 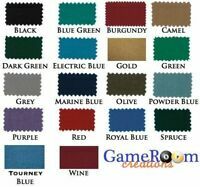 We ask the league to provide a better alternative and we came up with these. They are perfect! The play has improved league wide and are very happy with our choice. 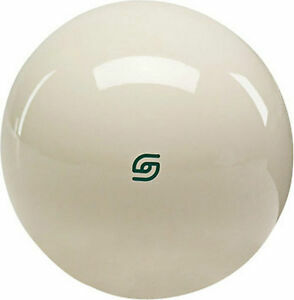 If you're sick and tired of banging around a brick at your favorite social club/bar "coin operated table", the Green Logo Aramith Cue Ball is a must have....It helps the beginners to intermediate player play more productively and overall get more enjoyment out of playing pool!!! Nice Que ball works great !! Works great. After scratching this que ball returns every time in our Valley table. Works just the way I hoped it would. Replaced a much heavier ball that was a nightmare to shoot with.